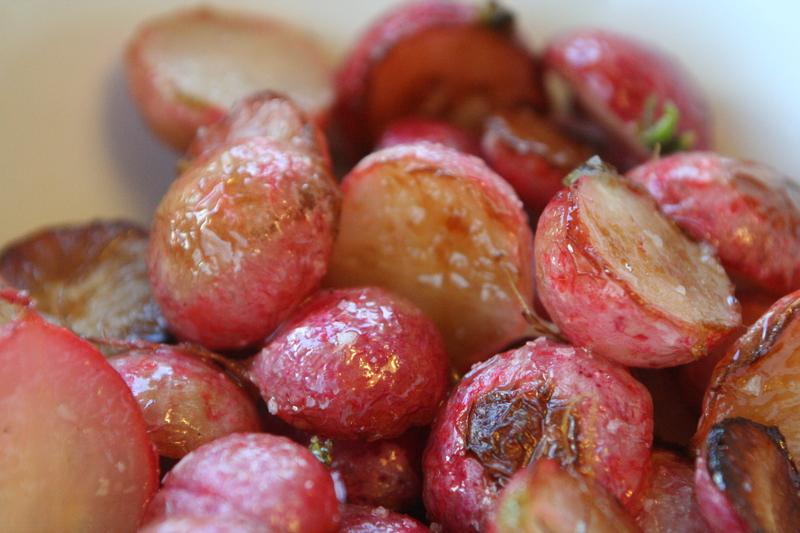 If you like roasted root vegetables like turnips and beets, you’ll love roasted radishes. I had never eaten a radish that was cooked, so I was intrigued when I started seeing recipes for roasted radishes popping up everywhere. The roasting gives them a sweet, earthy flavor and takes away their bite completely. Try it! Heat the oven to 400 degrees. Scrub the radishes and chop off the green tops. Cut each radish in half vertically. Toss the radishes with the olive oil and lay them cut-side down on the pan. Sprinkle liberally with coarse salt. Roast for about 15 minutes, tossing them about halfway through. They will take on a caramel brown color at the edges. Squeeze a lemon wedge over them and serve. This entry was posted in Gluten Free, Healthier Options, Vegetarian and tagged farmers market, local, radish, roasted radishes, roasted root vegetables, seasonal, side dish, spring, vegan, Vegetarian, veggie. Bookmark the permalink. These look great. I’ve never had cooked radishes, but I love roasted vegetables. Will need to give these a try! What a clever idea. They look so festive. Just recently I saw someone cook radishes along with a roast, as one would potatoes. Either way, I think they sounds delicious roasted. Thanks for the idea. The sautéed ones in butter were great. I will try these.